Here's a pic of my simple sorting of 140 ELD-M.. approx. +500 pills. My goto pill for range 6.5 cm small groups. This is a simple visual with no scientific method, and the 140.0 bin has been already been emptied once, so it really should be +200 pills, ie a lot more/higher than 139.9. I pick a bin to load a series from, to keep the pills within a small weight range. 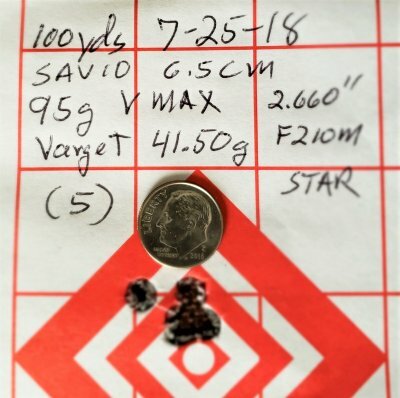 My best 100 yard group today, 5 shot, SAV 10 GRS. 100 gn AMAX, 41.36 gn Varget, 2.660" COL, F210M, Starline. First time trying the 100s, was one out of 4 loads of Varget. 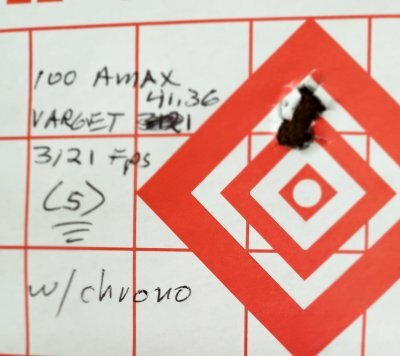 Settled in on 41.50 gr Varget, F210M, Starline brass and 2.660" COL for about 3150 fps. Fired my SAV 10 GRS with Vortex Viper scope off a solid granite bench. Tried 8208 but Varget was noticeably better. Reloading / middle look ok ? from new annealer : what do you think, left not enough, right side to much, middle ok ? Bolt Action Rifles / get'n there..
Have a brand new 10 GRS, mounted the scope & bubble level, its not been fired yet. The bolt is extremely difficult to remove & replace using the trigger depress then bolt release procedure. Only one out of ~ten tries works either in or out. Been pestering Jerry with QL * OBT questions,, he's been patient & very helpful in my learning curve with these. I am asking if heavy muzzle breaks and cans have been seen to alter OBTs on bolt guns ? Also, do gas guns with various gas port lengths, also follow the posted OBT values ?